How many rules have been vetted in the literature with regard to how simulation should be designed and conducted? The answer? (drum roll, please……..) Not many. This is an important point to consider when making the decisions that are part and parcel to you creating successful simulations. Healthcare simulation can take on many forms including designs for pure teaching activities through assessment activities, covering a broad range of objectives or simply a few. The bottom line is there are many ways to do simulation correctly. One of the first things to be aware of is that you must start with the end in mind. Ask yourself what you really want to accomplish. And by the way, I’m not talking about the simulation. The simulation is actually the means to get to what you want to accomplish. Hopefully! What you a want to accomplish is ensuring that the healthcare providers who complete your learning and/or assessment activity are likely to provide better healthcare in the future by way of increasing their confidence and competence in what they do. Common rule club fallacies include imposing some magical formula on the length of the debriefing as related to the length of simulation, demanding that you must use video review, demanding that you must design your simulation to mimic real healthcare, demanding that you must use the highest technology available, demanding that you must conduct your simulation in an environment that is as real as possible, demanding that you must debrief in a different room than where the simulation took place, demanding that you must not let the simulator die and on and on and on…… Bunk….. it’s all bunk. 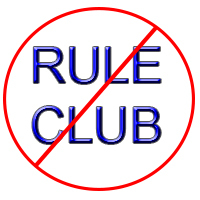 Trying to follow all of the rules of rule club will just slow you down, impede your ability to reach your goals and make you sit around and wonder why you didn’t accomplish what you set out to do even though you were working so hard. Worse yet, it might even make your boss think that you can’t get enough done. Are their best practices emerging, is there some science to guide us? Absolutely! Just not much! We know we must provide a safe learning environment, provide feedback that usually will include a debriefing (but maybe not always). But there is no secret recipe hidden on the planet that you will be able to receive at a meeting and go home to bake a magical, successful simulation cake. So in summary, envision and brainstorm with the end it mind. Then take all of your accumulated knowledge of the science and best practices as well as the information you get from others and make the program fit your realities! Do this non-apologetically, collect data along the way, and you will find yourself becoming much more productive then if you are trying to follow a specific recipe of rule club who tend to stand atop the mountain and issue commandments to make you feel guilty if you don’t follow them!